Professional cellist Natalya Tsvetnenko moves seamlessly among the elite where she fills the souls of symphony patrons with beauty even as she takes the lives of the corrupt of Australia’s ruthless underworld. The cold, exacting assassin is hired to kill a woman who seems so innocent that Natalya can’t understand why anyone would want her dead. As she gets to know her target, she can’t work out why she even cares. Requiem for Immortals is set in Melbourne, Australia, but to be honest, I didn’t really feel the Aussie flair coming through with the exception of the scenes set around the Melbourne Cup. The characters in this novel are dominated by females, which is a nice change in the mystery/thriller genre. 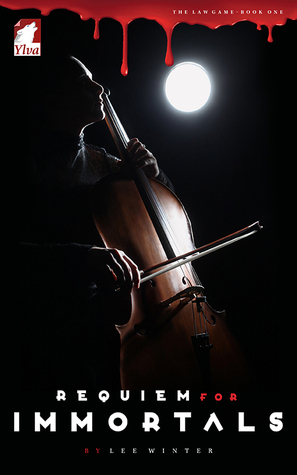 The main character, Natalya, is a brilliant cellist with a secret life as an assassin. She is cold and calculated, and enjoys the power she has over other people. As a main character goes, she is strong but flawed and somewhat of an anti-hero. Her target, Alison Ryan, initially appears meek, but as the story progresses, it becomes clear this isn’t necessarily the case. Other assassins and crime bosses which feature are female, and all of them have their own quirks that make them memorable. The story starts out in Natalya’s viewpoint. Initially, I was slightly put off by her early power plays, but continued because I wanted to see where the story would go. The developing romance between Natalya and her target, and the mystery surrounding who hired Requiem in the first place intrigued me. The romance subplot tied into the main storyline nicely and wasn’t heavy-handed. There were a few twists I didn’t see coming. The switch in viewpoint away from Natalya in the second half of the books a surprise, especially because I’d become used to following Natalya around. I understand why this was done, but I did feel the second half of the book was rushed, and less exciting than the first half. Overall I enjoyed the mystery and discovering a new Aussie Author I hadn’t heard of before.